The VWR Sheldon 1217 Digital Oscillating Water Bath comes from a line of baths from a reliable industry leader in laboratory instruments. This shaking water bath has long element life with over-temperature protection. The model 1217 shaking water bath has PID a Microprocessor temperature control and comes with speed controllers. There is also a digital display for rpm and temperature. The soft-touched keypad featured on the VWR shaking water bath, allows control of temperature, oscillation speed, and calibration. The Sheldon 1217 water bath by VWR also has an air jacket design that features a non-contact, recessed heating element to avoid hot spots and burnouts. VWR Scientific is a dependable company who provides outstanding products for any area in the lab. 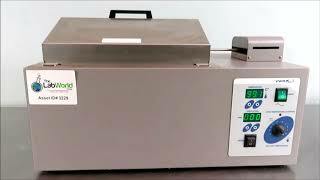 The VWR Sheldon 1217 Digital Oscillating Water Bath has a capacity of 4.2 gallons and has been has been tested to 85°C. This VWR shaking water bath has been tested to perform at the manufacturer listed specifications. All of our lab equipment comes backed with our standard warranty. Should you have any questions, please don't hesitate to contact us.